Andrew, the son of Jonah and brother of Peter, was born in Bethsaida and was a fisherman by trade. At first he was a disciple of St. John the Baptist, but when St. John pointed to the Lord Jesus, saying, Behold the Lamb of God! (John 1:36), Andrew left his first teacher and followed Christ. 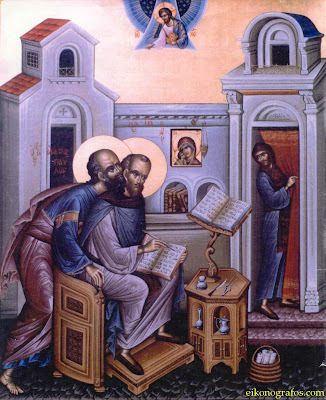 Then, Andrew brought his brother Peter to the Lord. Following the descent of the Holy Spirit, it fell by lot to the first apostle of Christ, St. Andrew, to preach the Gospel in Byzantium and Thrace, then in the lands along the Danube and in Russia around the Black Sea, and finally in Epirus, Greece and the Peloponnese, where he suffered. 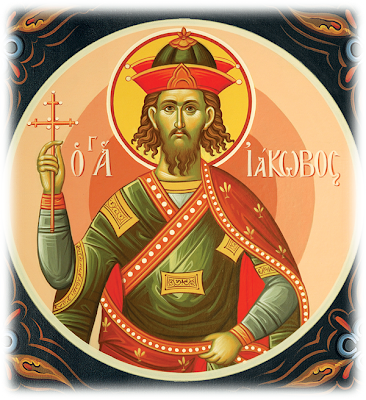 In Byzantium, he appointed St. Stachys as its first bishop; in Kiev, he planted a Cross on a high place and prophesied a bright Christian future for the Russian people; throughout Thrace, Epirus, Greece and the Peloponnese, he converted multitudes of people to the Faith and ordained bishops and priests for them. In the city of Patras, he performed many miracles in the name of Christ, and won many over to the Lord. Among the new faithful were the brother and wife of the Proconsul Aegeates. Angered at this, Aegeates subjected St. Andrew to torture and then crucified him. While the apostle of Christ was still alive on the cross, he gave beneficial instructions to the Christians who had gathered around. The people wanted to take him down from the cross but he refused to let them. Then the apostle prayed to God and an extraordinary light encompassed him. This brilliant illumination lasted for half an hour, and when it disappeared, the apostle gave up his holy soul to God. Thus, the First-called Apostle, the first of the Twelve Great Apostles to know the Lord and follow Him, finished his earthly course. St. Andrew suffered for his Lord in the year 62. His relics were taken to Constantinople; his head was later taken to Rome, and one hand was taken to Moscow." 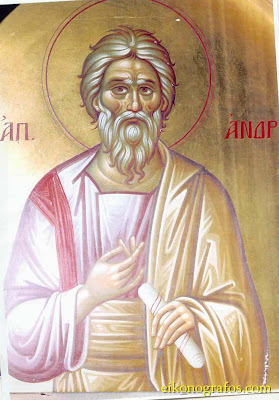 "In Sinope [Pontos, St. Andrew] prayed for the imprisoned Matthias, his chains fell from him, and the cell door opened. The people beat Andrew, breaking his teeth and cutting his fingers, and left him for dead in a dung heap. Jesus appeared to him and healed him, telling him to be of good cheer. When the people saw him the next day, they were amazed and believed. In Patras, Andrew healed the wife of the proconsul Aegeates of an incurable disease of the eyes. He healed a paralytic, lepers, and all manner of disease. Aegeates heard all of this and arrested Andrew. He tried to compel him through beatings to sacrifice to idols and so restore idolatry in his country. When Andrew refused, he was tied to a cross upside down so that he would live longer and suffer more. Twenty thousand of the faithful stood by and mourned. Even then, Andrew taught them and exhorted them to endure temporary sufferings for the kingdom of heaven. Out of fear of the people, Aegeates came to remove Andrew from the cross. 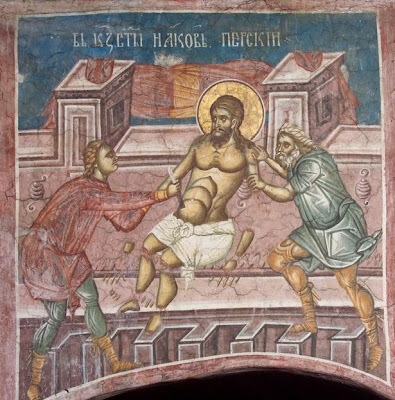 Andrew, however, said that Aegeates could still become a Christian, but that he had already seen Jesus and he would not allow himself to be removed from the cross. Suddenly, a heavenly light illumined Andrew for about half an hour, and then he gave up his spirit." In one of his tours, tradition holds it that the saint came to our island [Cyprus]. The boat, which was traveling to Antioch from Joppa, shortly before passing the well-known cape and islands of the Apostle Andrew, known by the name "Keys" [Kleides], had to stop there in a small harbor, because the wind lull. Over the last few days the water had disappeared. One morning, the master came to the island looking to find water, and he brought with him the Apostle. Unfortunately there was no water anywhere. At some point, when they arrived in the middle of the two churches which exist today, the old and new, that is built a little higher, the Saint kneeled in front of a dry rock and prayed to God to send water. He was seeking the miracle so that all those there would believe in Christ. Later he got up, signed the rock with the sign of the Cross and the miracle happened. From the root of the rock immediately came a spring of water, which runs until today in a pit of the old church and from there goes and comes from a fountain near the sea. It is well-known Holy Water. The blessed water, which refreshed them, but also many others, whole myriads, who partook with faith and were cooled and consoled. First among these was the blind child of the captain. - "Father, father", the child began to shout when [ψαχουλεύοντας] and ran to find his father. And the captain who was startled by the voices of the child ran to the place where he heard the voice. When he reached the child he stopped, bent down and opened his arms. - «My child, what are you trying to say?» the father asked with terror. - «Child, go and find the pappouli [old man] you were talking about, so we can thank him for what he gave us!». And the apostle, who everyone gazed on with admiration, began to speak and to teach the new religion. The end of the speech was very fruitful. All those who heard believed and were baptized. First was the captain with his child, who took the name Andreas. And then all the other passengers and some fishermen who were there. They all believed in Christ proclaimed to them by the Apostle and were baptized. Naturally, from the miraculous cure of the blind child, more and more began to follow. In the meantime the wind began to blow and the boat was prepared to continue his journey. The Apostle, who invited to him all those who believed in Christ and were baptized, gave them some final advice and bade them farewell. Thus on this blessed island was organized a group, a church of believers in the one True God. Many years later, on the place were the Apostle walked, which was blessed with the prayers, miracles, and sweat of the First-called, the great monastery of Apostolos Andreas was built, which over time became a Pan-Cyprian pilgrimage. 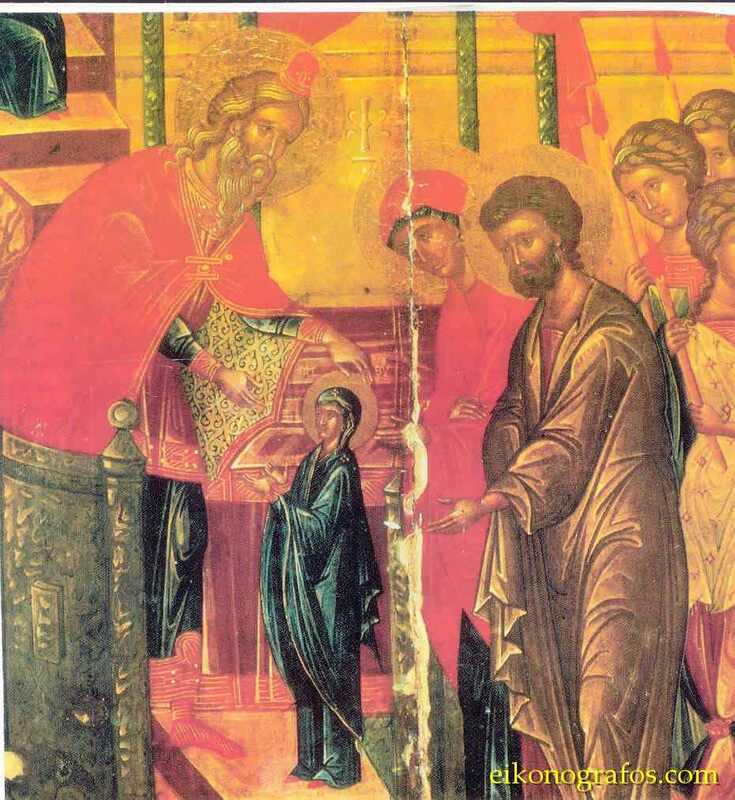 Each year thousands of pilgrims from all parts of Cyprus, orthodox and heterodox, and even heathen, gather at the monastery to venerate the miraculous icon of the Apostle, to baptize newborn children and offer rich gifts in money or treasure [είδη], to express thanks and gratitude to the divine Apostle. The church is the Font of Siloam to those who are suffering. Multitudes of miracles occur to those visitors with true faith and contrite souls. In all the temples of our martyred island [Cyprus] we will find the holy icon and the name of the Apostle as one of the most common among the people (Andreas or Adreani - Androula). For reasons only the Lord knows, for many years - since 1974 - the holy monastery together with all Karpasia, the Mesaoria and North Cyprus have been under the sovereignty of...the Turks. Liturgies are not normally performed in the blessed churches that are in these parts. And the bells are no longer rung to invite the faithful [to worship]... But the holy water which sprung from the land after the prayer of the Apostle Andrew remains and continues the gush forth. It continues to gurgle and waits for the holy hour when the faithful of the island, washed and purified in the tears of genuine repentance, will be free again to visit the beautiful monastery and to chant to the Lord thanksgiving for salvation from the evils and bitter trials and to drink and be refreshed from the sweet water. May God, with the help and the intercessions of St. Andrew the Apostle, and all of the other saints of Cyprus, make this day to come quickly. The end of the Apostle resembles the rest of his life. He was martyred in Patras, where he had arrived to convey the message of deliverance and spread the light of Christ. His visit brought forth many fruits. In a few days his teaching with the many miracles of his literally shook-up the foundations of idolatry in Achaia. Among the first who believed was the Proconsul himself. Thus it was said that during the Roman times, the Romans ruler who managed one of the provinces of the state which was called Lesvios, was gravely ill, and was healed by the Apostle. At the example of the Procounsul, other Pagans were quick to follow. But this became known in Rome, and the Emperor Nero, blinded [λύσσαξε] from evil, instructed Lesvios to be replaced immediately by Aegeatis, a very fanatic and hardened pagan. The First-called met everyday with Lesvios and continued his sermons and miraculous cures. Crowds of people from all over the Achaia watched with interest every day and many joined the ranks of believers. To them were also added the wife of Aegeatis, Maximilla, his brother Stratoklis, a wise mathematician, and many others from their relatives and company. The proconsul Aegeatis, although he saw his wife Maximilla was saved from certain death by the intervention of the First-called, and though he saw his brother Stratokli, who he admired so, accept the new faith, he remained unmoved. He met with his wife and said that he would deny Christ. But Maximilla did not listen to him. -I prefer to be separated from you than from my Christ. And he, blinded by his passion, ordered the arrest of the First-called and for him to be placed in prison. To blackmail the woman who was committed to Christ, he threatened that if she did not return to the idolatry of their fathers, he would horribly torture the Elder Apostle and in the end will crucify him. Troubled, Maximilla ran to the prison to convery the threats of her husband. The good woman trembled, that such harm would befall the worker of her salvation. - Do not be afraid for my life, my daughter" the First-called said. "Keep your faith firmly. It 's an honor and grace of God for me to be made worthy to leave this world in the same way our Saviour did. Let Aegeatis do what he wants. Let him cut me with swords. Let him burn me with fire. Let him nail me to the cross. «The sufferings of this present time are not worth comparing with the glory that will be revealed to us». [Romans 8:18] Stratoklis, who was there, cried. - "Don 't cry", the apostle said. "One day we get out of this world. «For here we have no permanent city». [Hebrews 13:14] Watch only the seed of the Gospel, which has been sown in your heart. Let it spread carefully. The words of the Apostle boosted the courage of Maximilla and Stratoklis and increased [ατσάλωσαν] their willingness to fight to the end. The Aegeatis once again called his wife to him and tried with sweet words and flattering to separate [μεταπείσει] them from the faith of Christ. - I'm ready to do everything for your love, he said. If you are persuaded to leave Christ, you would be my queen in my house. Otherwise I will nail the old man to the cross, who took away your mind, and I will kill you. The response of Maximillas was truly heroic. - I prefer a thousand times death rather than life with a pagan like you. The words of the Christian heroine fired-up the anger of her husband, who gave a mandate to torture the Apostle hard and finally to lift him upon a cross, which had the shape of the letter X, which had been set up in the «mouth of the sea of Ammoudias» [«χείλος της θαλάσσιας αμμουδιάς» begins with the greek letter X. 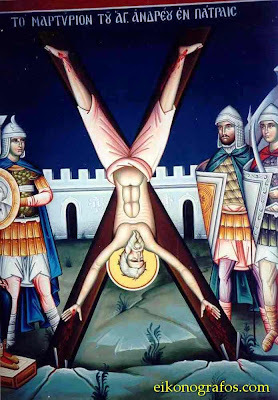 Note that other accounts hold that the St. Andrew asked to be nailed on an X-shaped cross, out of his feelings of unworthiness to suffer in the same way as Christ (the same sentiments that led to his brother, St. Peter, being crucified upside-down).] On the Cross, which was made from olive wood, the hands and feet of the Apostle were tied, not nailed. And this was done by the Proconsul to keep the Saint alive for a long time to torture him. From a sea, the beautiful sea of Galilee, the Lord called the great Fisherman to follow Him to become a Disciple and a fisher of men. 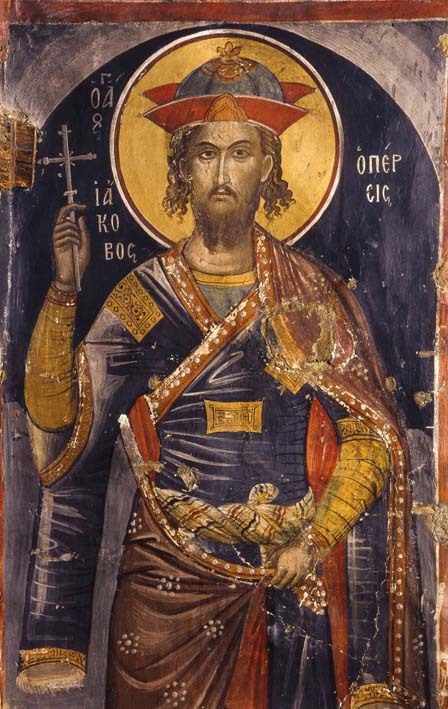 Somewhere else near the sea, the sea of the historic city of Patras, again Christ called his Disciple, the Apostle Andreas, after hard work of sowing his word, to reach our heavenly homeland, to receive the incorruptible crown of righteousness. The Apostle left this world at the age of 80. 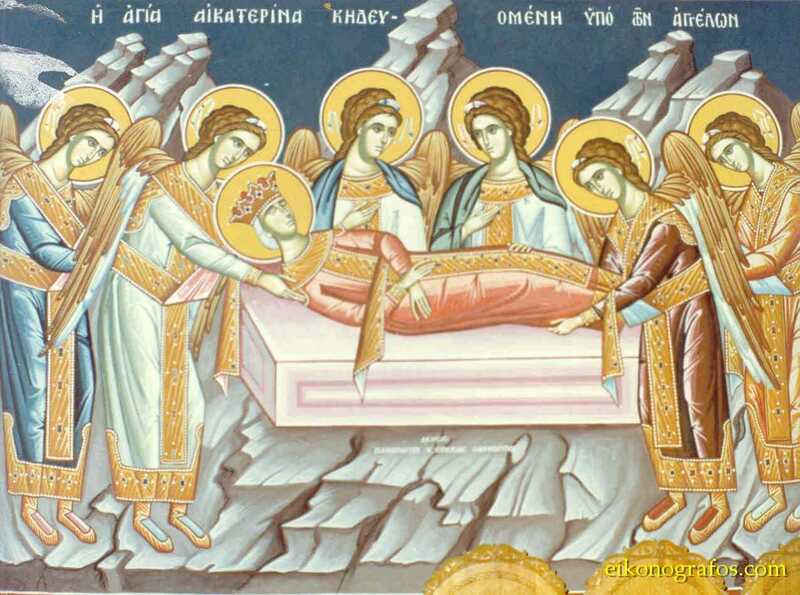 Christians of Achaia deeply mourned his death. The pain was still greater, when the Proconsul Aegeatis refused to surrender the holy relic for burial. But God worked thrings according to His Providence. On the same day the saint died, Aegeatis went crazy and committed suicide. "The death of sinners is evil." 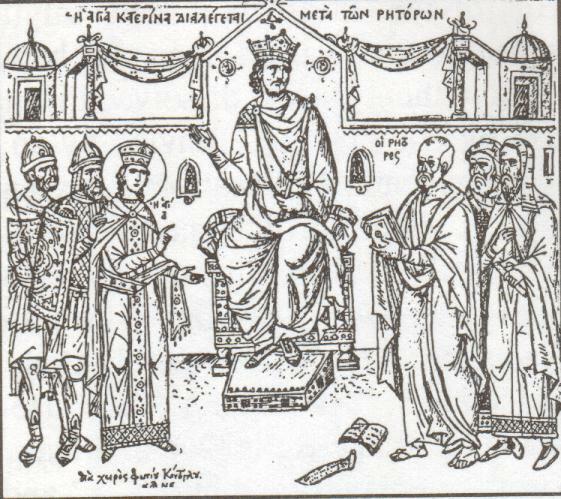 The Christians with their bishop Stratoklis, the first bishop of Patras, then received the the Sacred Relic and they buried it with great honor. Later, when the throne of Byzantium was ascended by Constantius, who was the son of Constantine the Great, part of the sacred relics were transferred from the city of Patras to Constantiniple and enshrined in the Church of the Holy Apostles «inside the Holy Altar». 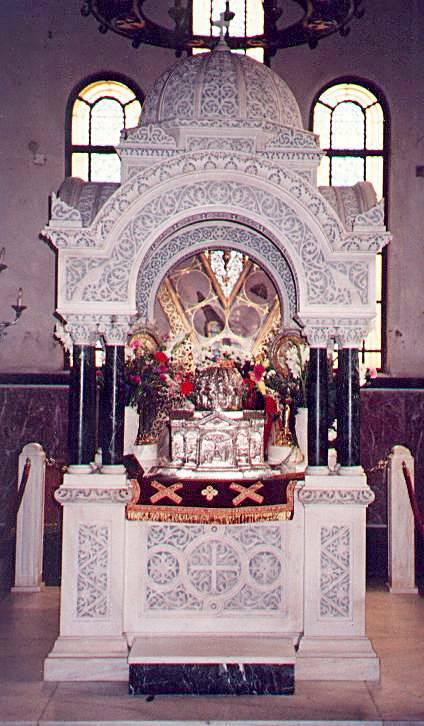 The holy of Skull of the First-called seems to have remained in Patras. But when the Turks were to occupy the city in 1460, then Thomas Paleologos, brother of the last emperor Constantine Paleologos and last Master of Moria, took the valuable heirloom and moved to Italy. 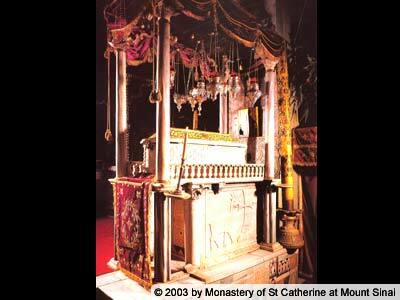 There it was placed in the church of St. Peter in Rome, where it remained until 1964. 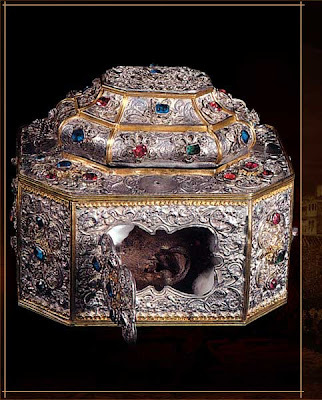 On September 26th of that year, a delegation from the pope Paul transferred from Rome the precious treasure and delivered it to its rightful owner, the Church of Patras. 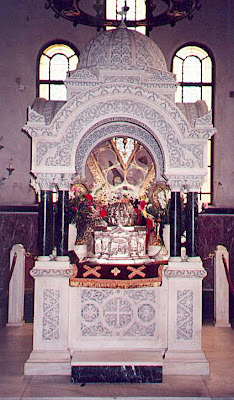 The holy Skull of the First-called, after the request of the Archdiocese visited Cyprus in 1967 for a few days and thousands of Cypriots then, young and old, men and women, started from all four corners of our island and went to venerate the Holy Skull of the First-called and show deep and pious reverance and gratitude for what he had provided the island. In memory of the great apostle let every the soul of every Greek heart kneel in devotion. He is one of the apostles who loved [Greece] and struggled to pass-on the unwaning light of Christ. May his message: «we have found the Messiah» become our motto for life. «We have found the Messiah» the First-called Apostle cries out also to us. Christ was and is the only Savior and redeemer of mankind. Thus you will also know Him, if you come to know the your Author and Lord and if you place His will and law as the guide of your life. Yes! if you put the holy will and his law as the guide and partner in your life. Because Christ was and is «yesterday and today by Him and in the century». The rescue us embrace this message with all unexceptional faith flogeri Do people in the martyred to see this place better days. That precipitate the sin rectified and again only an honest repentance. With genuine repentance and soul crushing us again resort to all our Savior Christ and ask you to forgive us as they once Ninefites and to restore to us our freedom. And we hear the Lord. We will certainly listen. We attest to the holy words: «Epikalesai with us says, if you thlipseos day in and exeloumai and beliefs with». Son, wherever you care, called the pain with you. And I hear. And will give you what you want, because it is for your own good. And will beliefs. Are you listening? Would give in and with beliefs. For a folk tale based on a true miracle of St. Andrew see: http://full-of-grace-and-truth.blogspot.com/2009/11/christallou-and-miracle-of-saint-andrew.html. 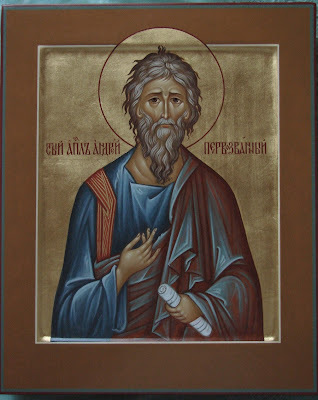 As first of the Apostles to be called, O Andrew, brother of him (Peter) who was foremost, beseech the Master of all to grant the world peace and our souls great mercy. Let us praise the namesake of bravery, the divinely eloquent and first to be called of the Disciples of Christ, the kinsman of Peter. As he called out to him in days of old, so now he calls to us, "Come, we have found Him for whom we yearned." St. Andrew intercede for us! 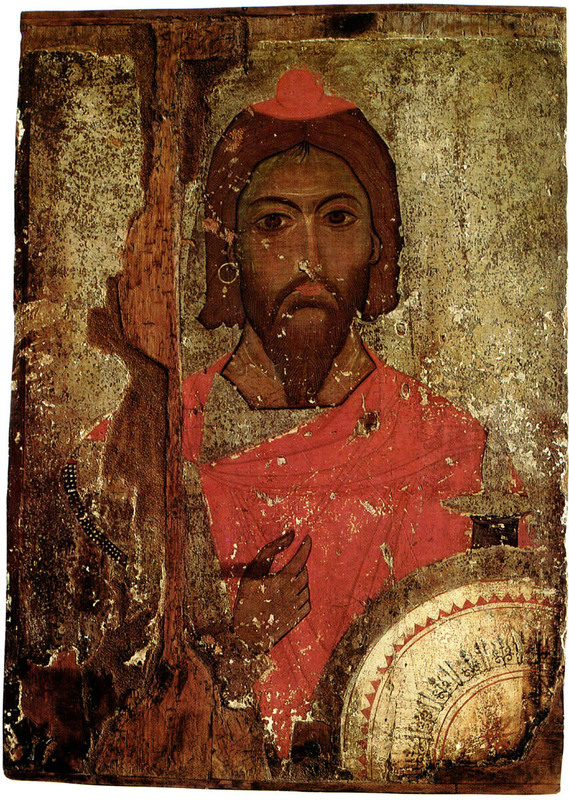 James, the glorious greatmartyr of Christ, was from Persia. He lived during the years of the pious Kings Arcadius and Honorius, the sons of the Great Theodosius, who ruled in the year 395 A.D. He abode in Veethiavan of Persia, situated in the land of Elouzeesion. Then, Isdigerdis I and Bahram V, his son, ruled over the Persians. They were cruel and pitiless men. They forced the Christians (whomever they found) to worship, as they did, the senseless idols. Now James was a lord of merit, notable and of good service to the nation. He was honored and beloved by all, as he was wealthy, knowledgeable and virtuous. Wherefore, he was first in the palace, and the king exceedingly loved him. He bestowed on him great importance and abundant gifts. So much did Isdigerdis and his son Bahram love James, that they did not wish to be separated even one hour from him. They displayed such favor, that they had him as a brother, for he was well-mannered and his family prominent. But this was so that they could cunningly lure him to impiety. For James was a Christian from childhood just as were his parents and wife, both pious and faithful to our Lord Jesus Christ. So, these villains tried hard to estrange him with gifts and gratuities. They elected to be good-natured and discreet, and to persuade him with benefits and flatteries, rather than with threats and torments. However, this marvellous James, who resisted at first, was defeated by the many generous favors of the ruler, and alas! he was captured. He denied the most sweet Christ and worshipped the demons, and became one in spirit with the king. But do not frown; hearken, and strengthen your heart, attend to this. Because just as one drop of water drips continually onto the hard marble to pefforate it, so many gifts and favors are able to convert the gratified soul with ease and quickness; thus, did the ever-memorable one have the solid rock of his faith hollowed out. But listen to his end to receive exultation and joy, that God (Who foreknows and foresees) does not overlook but straightens the fallen and illuminates the way of the blind. "It was not proper to your nobility to exchange falsehood for the truth; to defraud the faith for the honor of men and temporary rewards, which pass by as a dream and disperse like smoke; and to love the perishable and temporary kingdom, and abandon immortality and eternity. For this violation you would elect to be cast into the inextinguishable fire and endless torment? You, who are unworthy of His love, denied Christ, in order to gain one worin-eaten man? 0 the mindlessness! What are you able to benefit by them, when you go together into torment? We have been greatly distressed by you and pour forth many tears and, with all our hearts, we pray to the true God not to desert you, as He is compassionate, but to receive your return. So recognize the mischief that you have created to become a son of darkness, instead of light, which you were formerly. Recover and revert again to godliness. And, if you do not repent speedily, know this: you no longer have any relation with us. But we wish to be as strangers and foreigners to you, and you will inherit nothing from us, so as to be completely separated from our society. Because not one particle has the light with the darkness, and the faithful with the faithless. So make a good return. Whereas, you departed badly; but the Master, Whom you denied, will receive you with open arms and rejoicing. If you disdain our advice and tears, when you reach the divine trial, you will be punished in torments endlessly and your crying will be in vain. "Yes, I am a servant of my Lord Jesus Christ." The king's rage grew, but he remembered their previous friendship, so he did not make a display or an outburst of anger. As in preceding times, he tested him with flatteries and by promising gifts; but at other times, with threats of hideous punishments and torments, to see, perchance, if he would waver. But the coward was not effective, because the saint thirsted for martyrdom. "In vain you labor, attempting with feeble means to sow wheat in the guff, or to hold back the winds in a net. In this way, it is not possible any longer to change my belief from piety. So then, lay aside all hope, so as not to conceal your wrath any more, Cut my body into pieces, punish, burn it, do with it as you will, but my soul you will not be able to turn to godlessness." James, pity your body, your blossoming manhood, remember our im measurable friendship. Be not deprived of any worldly pleasures in this sweet life, in order to receive harsh pains and the bitterest death for these uncertain good hopes. I promise you that you will have wealth and power in my kingdom, greater than before. Yes, my beloved and dearest friend, I entreat you not to have contempt for our great friendship and appear before me ungrateful, because, if you disobey, it is necessary - although I do not want to - that you be taught a lesson. But do not think that I will be lenient later: no, it is not true, but I will change the love that I have for you now, into hatred that is commensurate with your disobedience. And I will deliver you to unheard-of, horrible torments." "0 king, do not waste time importunely. Do not frighten me with torments, nor insincerely compliment me with tributes and gifts, because I despise from my heart all temporal enjoyments, empty glory, decaying riches and bodily sensuality, in order to inherit the true wealth and the honor, inexpressible delight and bliss. Wherefore, gladly I divest myself of wealth and glory, friends and relatives, mother, wife and all the pleasures of the body. And not only these things, but I am prepared to receive 10,000 deaths, only not to injure my sweet Christ, the Beautiful One among the sons of men, Who fashioned the sun, moon and the remainder of creation, and His divine will is equal to His power. He who denies Him goes to endless death." This, in addition to other things, uttered the blessed James. And the king went into a furious rage, realizing it was impossible to pervert him. Wherefore, he took counsel with a certain senator, who recommended such severity, that upon hearing it, the king shuddered. That is: to dissever the joints, starting first with the fingers of his hands, and afterwards, the remainder of the joints. 0 the inhuman decision! What other unsparing tyrant ever revealed such pitilessness towards his friend? 0 savage judgment and inexorably-merciless soul! Whoever heard it felt empathy; not only the faithful, but even those godless idolators among the nations, wept at such a ferocious verdict. But our true martyr did not shrink back upon hearing such a sentence; rather, he hastened to the stadium with excessive joy and eagerness. "...for we are made a spectacle unto the world, and to angels, and to men"(AV; I Cor. 4:9). For even the Great Promoter of contests and Heavenly King was there and stood above him to strengthen him in this match and, in the end, to grant him the imperishable crown. As the admirable and magnanimous man observed the fierce executioners and the forbidding instruments with which they were to cut him into pieces, he did not fear those devices prepared. Every kind soul, seeing another suffering thus, would feel sorrow and pity for him as a man. But he did not show any gloom and never uttered anything foul, nor did he suffer to do anything unworthy of his valor. But, as if his flesh was insensible, he stood with a joyous glance and cheerful face. "Behold what will happen to you for your disobedience. We have been instructed to cut off your members one by one: your fingers, hands, feet, arms, ankles, knees, and finally your head. Therefore, reason before you taste these horrors and do that which is for your own -good, for there is no repentance afterwards." "Weep not for me, 0 wretched ones, but lament for yourselves and your children, as you will go to eternal damnation with your gods for these temporal pleasures. I though, for a day's pain, will inherit the Kingdom of my Lord Jesus Christ and, also, indescribable joy and everlasting bliss." After saying this, he noticed that the executioners were readying their tools to cut off his limbs. Consequently, he asked time to make a prayer to the Lord, and he prayed that He would strengthen and assist him to complete the contest and receive the crown of martyrdom. "0 Lord Jesus Christ, the Help of all those who are helpless, the Hope of all the hopeless, and the Strength of all the weak: receive the first branch of this tree by Thy mercy. For as the vineyard gives forth leaves even when it is trimmed, thus will I appear before Thy judgment seat, safe and upright on the Day of Resurrection." When they cut off his second finger, he said, "Receive, 0 Lord, the second branch of the tree that Thy right hand hath planted." His face was joyous and festive, as if he perceived our Lord's future endowments. Then, they cut off his third finger, and he said, "With the three youths in the furnace, I sing to Thee and honor Thee, 0 Lord; with the choirs of martyrs, I sing praises to Thy holy name." As they cut off his fourth and fifth fingers, his mouth was filled with praise, and he said, "In my five senses I bless Thee, 0 Lord; wherefore, receive the good pains of my right hand as a blessed fruit, 0 Master." Then they severed the fingers of his left hand, one by one, and he was grateful at each, saying an appropriate praise and hymn. "Beloved brother, have pity upon yourself, for they will administer upon you an evil death, and in losing your life, you will be deprived of your mother, wife, and the rest of life's enjoyments. Do not grieve for your fingers, as we have doctors here capable of curing them. You have sufficient wealth and do not require the use of your hands. So listen to us, for your own good, and just say one small word with your mouth, so that it will appear as if you obeyed the king's command and, thereby, you will be delivered from the evil torturers. But in your heart, you believe in God and, when you return again to your country, you can repent and ask forgiveness of Him." "God forbid! I will not commit such a pretense. One cannot serve two masters. Whosoever puts his hand to the plough and turns back, is not worthy of the heavenly bliss. It is not right for me to love my mother and wife more than I love my God and Savior. Whosoever does not lift up his cross to follow Christ, is an unworthy servant. For these small pains, I go to my Master to receive the laurel of martyrdom. Therefore, I pray thee, do not sorrow for me, but rejoice and be glad with me." As the executioners heard this, they cut off the toes of his feet one by one, in order to submit him to even more pain. But he was firm and adamant, thanking them at each toe, singing a hymn. At one point he was heard to say, "The aftlictions of the present are not worthy of the future glory. At other times, he encouraged himself, saying, "Why is my soul saddened?" and many other verses. Then, they cut off his feet at the ankles. And then, they severed them again at the knees. Afterwards, they mercilessly cut off his hands and arms. But the resolute one endured with a great soul, as he saw his fingers, hands and legs on the ground. He did not utter one angry word at the executioners or the judge, but only prayed incessantly, in order to comfort and encourage himself, with verses from the old Testament, such as: 'I will sing unto the Lord throughout my life, I will chant to my God for as long as I have my being. May my words be sweet unto Him, and I will rejoice in the Lord." Behold a true martyr's valor! Behold Thy wonders, 0 Christ King! How did the invincible one withstand such rigorous pains and afflictions? 0 ye listeners, were you not awestricken, or was not your soul grieved at the sight of such an unprecedented mutilation? All those who were present at this fearful and horrid sight (not only the faithful, but even the persecutors, and the very senseless rocks), must have felt pity. Only that unbending soul and friend of Christ did not weep, but withstood those terrifying and awful tortures with a serene and upright face. For such is the love of God. When it possesses a noble soul, it empowers it to overcome nature and not to fear pains and punishments. Without this power, it would have been impossible for him to bear so many torments' as did the others who, for the loss of an arm or leg, died instantly, being unable to bear the excruciating pain. But the praiseworthy and ever-blessed one did not experience three or ten deaths, but twenty or thirty. The blood ran as rivers, the flesh fell, the veins were severed, the nerves plucked out, the arteries destroyed, the members were scattered. The audience fainted and the executioners grew weary. The demons, having been vanquished, were horror-stricken and panicked. The angels marvelled. But he that endured, seemed joyous, and his eye was not morbid, but cheerful, and he looked merry, rather than dismembered. Then they cut off the thighs of the martyr, and the pain was so acute, that he cried out saying, "Christ, help me." And the executioners said to him: "Did we not tell you that you will suffer extreme pains and tortures, and you did not believe us? Now ask your God to save you from these punishments. And he answered: "I do not ask Christ to rescue me from the torments, but to strengthen me till the end, so that I may receive the laurel, 0 senseless ones. I felt pain, in order to prove that I am in the flesh. But earlier, my mind was in my Lord Jesus Christ, Who lessened my pains, and I did not feel anything. Truly, just as the anvil is struck by the hammer and feels nothing, also I felt nothing, as I was being tormented. Therefore, I thank my God, and beg of you not to feel sad for me, but do dissolve this old structure of my flesh, that a new and brighter one will be raised up. Since you have cut off the branches, do not hesitate to chop down the tree also, that I may receive the heavenly bliss. For just as a deer wishes to reach the rivers of water, so I desire in death to attain my Creator." Even though he was dismembered thus, the invincible one safeguarded his piety and won trophies against all of them, with the aid of the Holy Spirit and his unsurpassed desire. He remained, therefore, only with his head and torso, a dreadful sight to behold. Alas! But the villainous rulers, seeing that, even though he was dismembered, he was not afraid, but, rather, they were frightened. They had no further hope for him, so they ordered his honored head to be cut off, as the other members of his body. They ordered this, not because of any merciful sentiments or sympathy, but from their excessive shame, so that it would not seem that James defeated them, dismembered thus, and that the invisible power of the Lord might not be confessed in the saint. After the decision, the saint was solaced somewhat. He moved his honored head with difficulty, and prayed thus: "0 Lord, Father Almighty and Lord Jesus Christ and Most Holy Spirit, I thank Thee that Thou hast enabled me to endure these torments for Thy holy name. But I pray Thee, make me worthy to complete this contest, for 'the pangs of hell came round about me' (LXX, Psalm 17:5). They have severed all my limbs. I have no legs to stand on and worship Thy majesty, nor hands to lift up to heaven to pray and call Thy name. They left me neither knees, nor arms, the merciless ones, but I remain as a branchless tree without roots. Therefore, I beseech Thee, 0 Most Holy King, abandon not Thy servant, but take my soul out of the prison of my body, and place it among Thy holy martyrs, so that we may glorify forever Thy majesty in the ages to come. Amen." After he said these things, they cut off his honorable head, and thus, he achieved all those indescribable blessings: "Eye hath not seen, nor ear heard, neither have entered into the heart of man, the things which God bath prepared for them that love Him" (I Cor. 2:9). If then, as Saint Paul says, each one of us will receive a reward according to his own labor, how great will be his reward, who died a myriad deaths and witnessed suffering above all human endurance? In all truth, just as the pains and anguish were atrocious, so will the pleasures be painless, the rewards countless, the delights unutterable, and the crowns glorious. 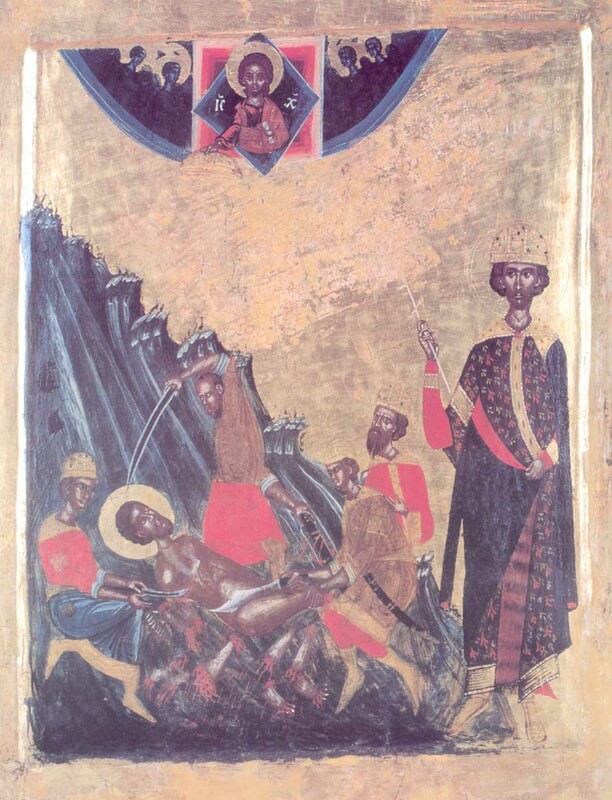 The blessed James received his martyrdom in Babylon, on Friday, November 27. Immediately afterwards, certain Christians, beloved of God, approached the guards and offered them money, in order to permit them to take part of his holy relics. But out of fear for the king, they did not wish to consent to this. Then the pious ones left, as if to depart, but actually they hid nearby and awaited till it was dark to procure at least a part of the relics. And as the night wore on, the guards fell asleep, the pious Christians crept forward, quietly, and carried away the precious relics of the martyr. They buried them devoutly and with honor, as an everlasting memorial and remembrance to the glory and praise of our Lord Jesus Christ, to Whom is meet honor, song and worship, with the Father and the All-Holy Life-giving Spirit, now and ever and unto the ages of ages. Amen. Translated froin the Greek by Leonidas Papadopulos and Georgia Lizardos from the Great Synaxaristes of the Orthodox Church, Volume 11, November, 5th Edition. Athens, Greece. Publisher: Archimandrite Md tthew Lagges, 1979, pp.677-685. Copyright © by Papadopulos & Lizardos 1982. 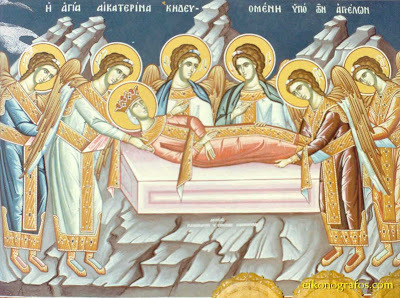 Another account available here: http://www.johnsanidopoulos.com/2009/11/holy-great-martyr-james-persian.html. Απολυτίκιο. Ήχος δ’. Ταχύ προκατάλαβε. Ο Μάρτυς Ιάκωβος, ο της Περσίδας βλαστός, τον δόλιον δράκοντα, τοις των αιμάτων κρουνοίς, αθλήσας απέπνιξε, πίστει γαρ αληθείας, μεληδόν τετμημένος, ώφθη τροπαιοφόρος, του Σωτήρος οπλίτης, πρεσβεύων αδιαλείπτως, υπέρ των ψυχών ημών. Be entreated, O Lord, by the sufferings endured for You by the Saints, and we pray You, heal all our pain. The Martyr James, from the root of Persia, through his struggle drowned the deceiving dragon in the streams of his blood. For the faith of the truth, his members were cut off, he appeared as a trophy-bearer and soldier of the Savior, and he intercedes ceaselessly for our souls. Let us all cry out from our soul, and shed tears, beholding how the Martyr is bitterly torn apart. For his executioners have gathered around like dogs, and have torn apart the members of this wondrous and brave Martyr among the Martyrs. For would you not say that he was a little patient? And I respond diligently how he was offered to the Lord, when all of his body was pruned like a vine. 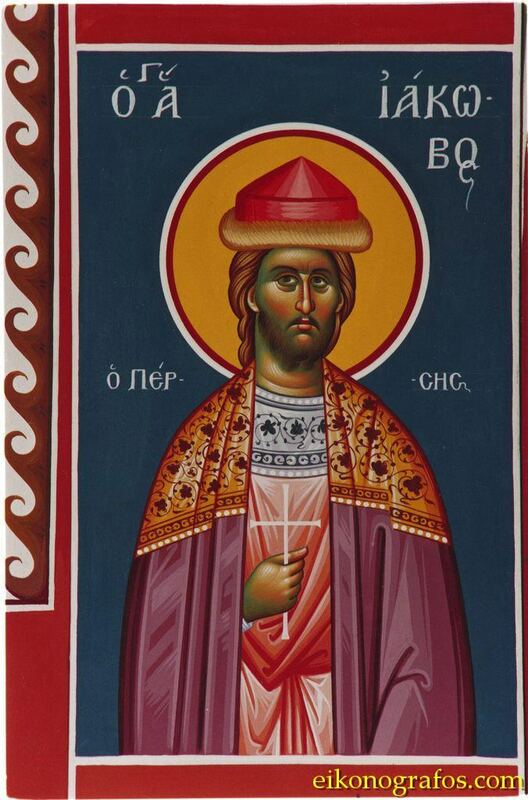 On the 27th of this month (November), the memory of the struggle of the Holy Great Martyr James the Persian. "That I might save my soul, take away my members", he says. On the twenty-seventh, the Persian was torn to pieces. St. James the Persian the Great-martyr, intercede for us! 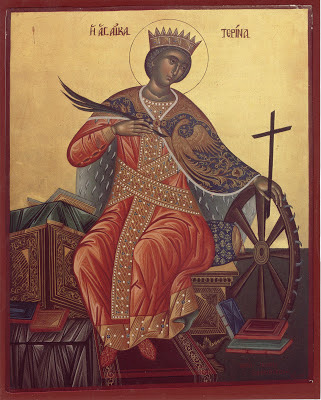 ***Note: According to the ancient usage, Saints Catherine and Mercurius were celebrated on the 24th of this month, whereas the holy Hieromartyrs Clement of Rome and Peter of Alexandria were celebrated on the 25th. 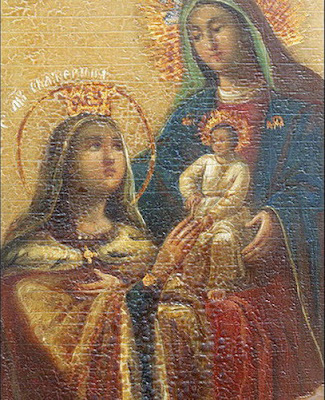 The dates of the feasts of these Saints were interchanged at the request of the Church and Monastery of Mount Sinai, so that the festival of Saint Catherine, their patron, might be celebrated more festively together with the Apodosis of the Feast of the Entry of the Theotokos. 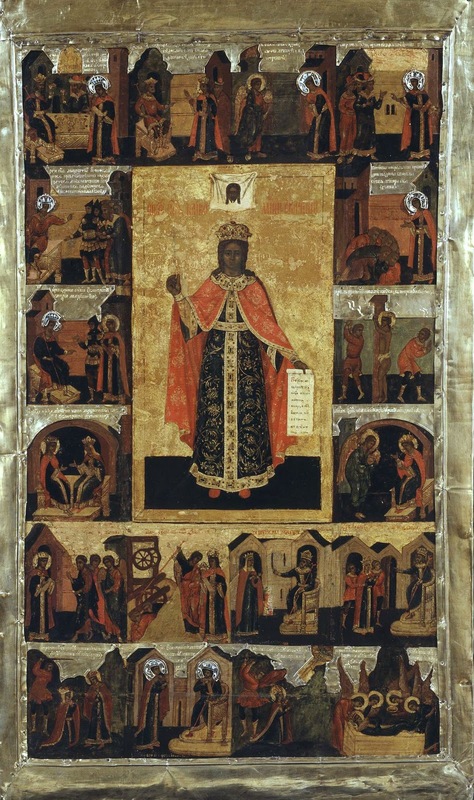 The Slavic Churches, however, commemorate these Saints on their original dates. 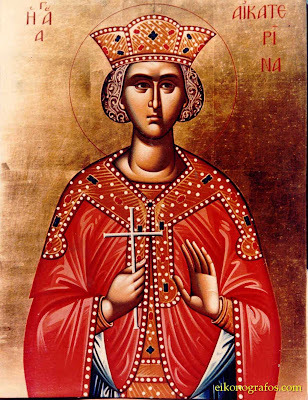 "The Holy Great Martyr Katherine was the daughter of Constus, the governor of Alexandria in Egypt, during the reign of the emperor Maximian (305-313). Living in the capital, Katherine received a most splendid education, having studied the works of the finest philosophers and teachers. Young men from the most worthy families of the empire sought the hand of the beautiful Katherine, but none of them was chosen. She declared to her parents that she would only enter into marriage with someone who surpassed her in reputation, wealth, beauty and wisdom. Katherine's mother, a secret Christian, sent her for advice to her own spiritual father -- a saintly elder pursuing prayerful deeds in solitude in a cave not far from the city. Having listened to Katherine, the elder said that he knew of a youth, who surpassed her in everything, such that "His beauty was more radiant than the shining of the sun, His wisdom governed all creation, His riches were spread throughout all the world ". The image of the Christ produced in the soul of the holy maiden an ardent desire to see Him. In parting, the elder handed Katherine an icon of the Mother of God with the God-Child Jesus on Her arm and bid her to pray with faith to Mary to show her a vision of Her Son. 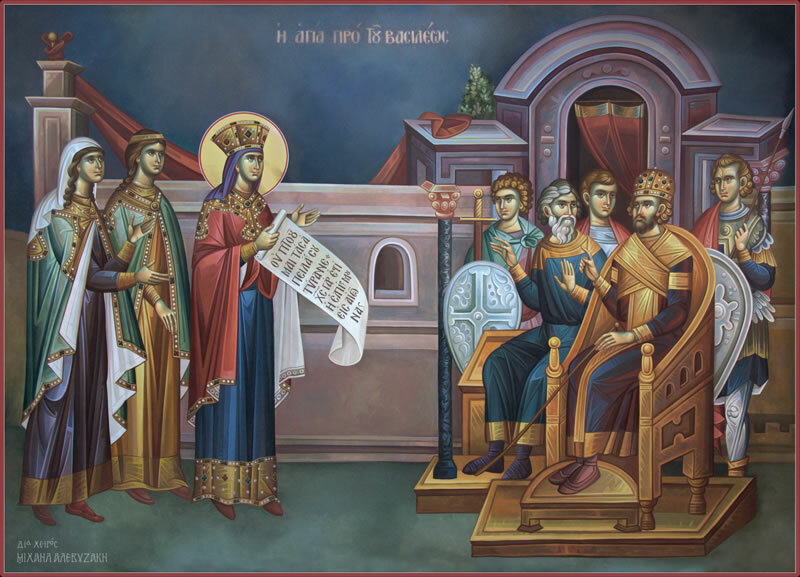 Katherine prayed all night and was able to see the Most Holy Virgin who told Her Divine Son to look upon the kneeling of Katherine before Them. But the Child turned His face away from her saying that He was not able to look at her because she was ugly, of shabby lineage, beggarly and mindless like every person -- not washed with the waters of holy Baptism and not sealed with the seal of the Holy Spirit. Katherine returned again to the elder deeply saddened. He lovingly received her, instructed her in the faith of Christ, admonished her to preserve her purity and integrity and to pray unceasingly; he then performed over her the sacrament of holy Baptism. And again Saint Katherine had a vision of the Most Holy Mother of God with Her Child. Now the Lord looked tenderly at her and gave her a ring -- a wondrous gift of the Heavenly Bridegroom. At this time the emperor Maximian was himself in Alexandria for a pagan feast day. Because of this, the feast was especially splendid and crowded. The cries of the sacrificial animals, the smoke and the smell of the sacrifices, the endless blazing of fires, and the bustling crowds at the arenas filled Alexandria. Human victims also were brought -- because they chose to die in the fire rather than deny Christ under torture. The Saint's love for the Christian martyrs and her fervent desire to lighten their fate impelled Katherine to go to the emperor-persecutor Maximian. Introducing herself, the saint confessed her Christian faith and with wisdom denounced the errors of the pagans. The beauty of the maiden captivated the emperor. In order to convince her and show the superiority of pagan wisdom, the emperor gave orders to gather 50 of the most learned men of the empire, but the Saint got the better of the wise men, such that they themselves came to believe in Christ. 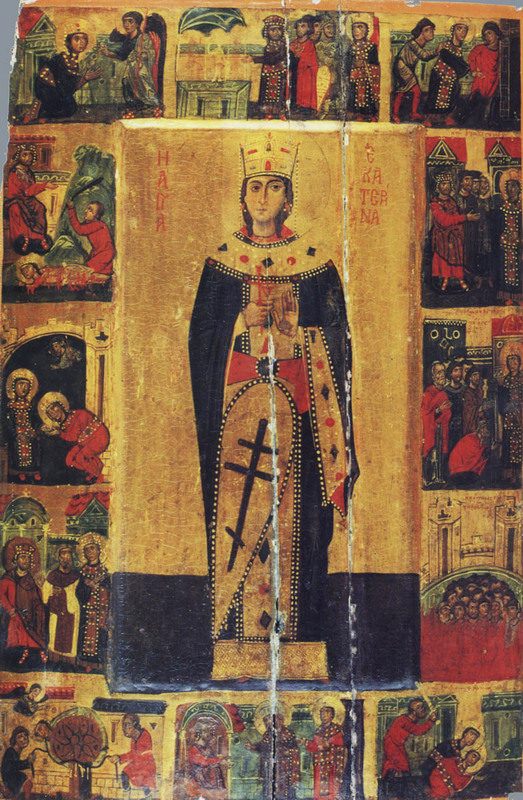 Saint Katherine shielded them with the sign of the cross, and they bravely accepted death for Christ and were burnt by order of the emperor. Maximian, no longer hoping to convince the saint, tried to entice her with the promise of riches and fame. Having received an angry refusal, the emperor gave orders to subject the saint to terrible tortures and then throw her in prison. The Empress Augusta, who had heard much about Katherine, wanted to see her. Having succeeded in convincing the military-commander Porphyry to accompany her with a detachment of soldiers, Augusta went to the prison. The strong spirit of Saint Katherine, whose face glowed with Divine grace, impressed the empress. The holy martyr explained the teachings of the Christians to the people and they believed and were converted to Christ. On the following day they again brought the her to the judgment court where, under the threat of being tortured on a wheel of spikes and nails, they urged that she recant from the Christian faith and offer sacrifice to the pagan gods. 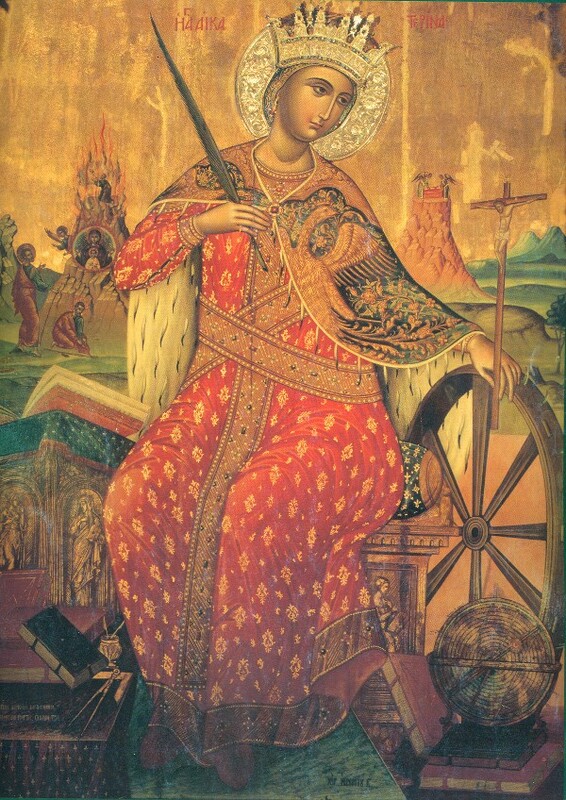 The saint steadfastly confessed Christ and she herself approached the wheel; but an Angel smashed the sharp tools, which broke up into pieces that hit pagans who were passing by. 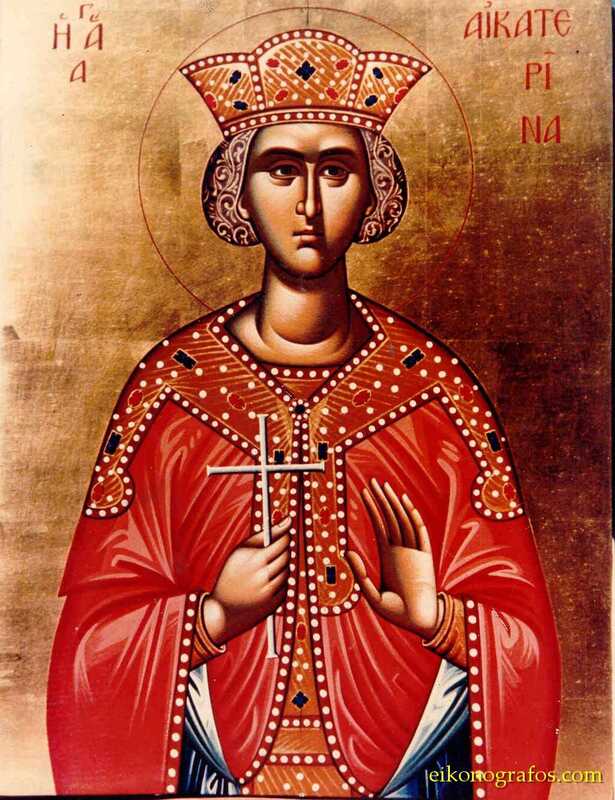 Having beheld this wonder, the empress Augusta and the imperial courtier Porphyry with 200 soldiers confessed their faith in Christ in front of everyone, and they were beheaded. Maximian again tried to entice Saint Katherine, proposing marriage to her, and again he received a refusal. She confessed her fidelity to the Heavenly Bridegroom Christ, and with a prayer to Him she herself put her head on the block under the sword of the executioner and was beheaded." At her execution, milk flowed from her wounds instead of blood by the Grace of God." For three hymns in praise of St. Catherine, see: http://full-of-grace-and-truth.blogspot.com/2009/11/three-hymns-in-honor-st-catherine-great.html. 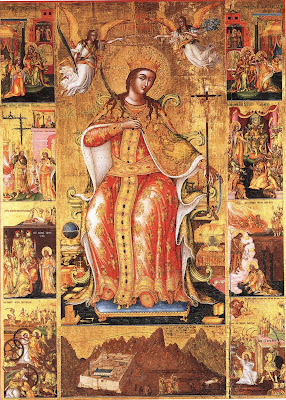 Saint Catherine the Great-martyr, intercede for us! "When the Most-holy Virgin Mary reached the age of three, her holy parents Joachim and Anna took her from Nazareth to Jerusalem to dedicate her to the service of God according to their earlier promise. It was a three-day journey from Nazareth to Jerusalem but, traveling to do a God-pleasing work, this journey was not difficult for them. Many kinsmen of Joachim and Anna gathered in Jerusalem to take part in this event, at which the invisible angels of God were also present. 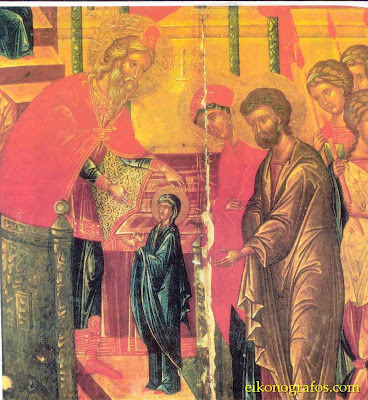 Leading the procession into the Temple were virgins with lighted tapers in their hands, then the Most-holy Virgin, led on one side by her father and on the other side by her mother. The virgin was clad in vesture of royal magnificence and adornments as was befitting the ``King's daughter, the Bride of God'' (Psalm 45:13-15). Following them were many kinsmen and friends, all with lighted tapers. Fifteen steps led up to the Temple. 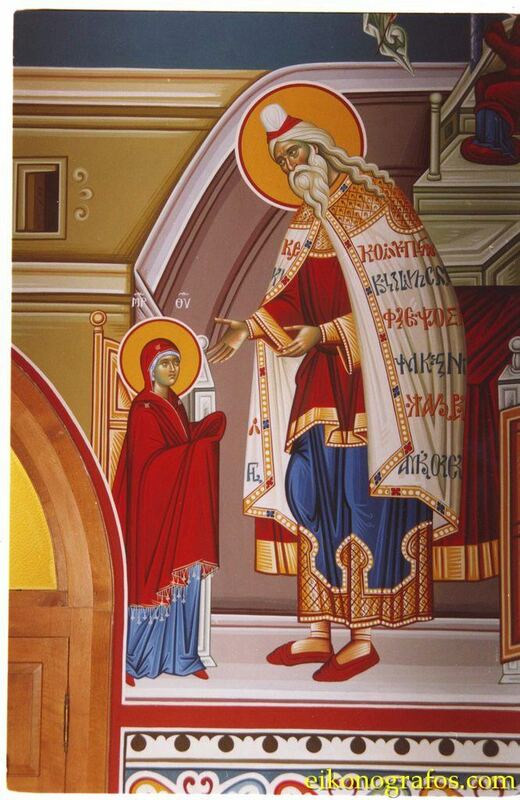 Joachim and Anna lifted the Virgin onto the first step, then she ran quickly to the top herself, where she was met by the High Priest Zacharias, who was to be the father of St. John the Forerunner. Taking her by the hand, he led her not only into the Temple, but into the ``Holy of Holies,'' the holiest of holy places, into which no one but the high priest ever entered, and only once each year, at that. 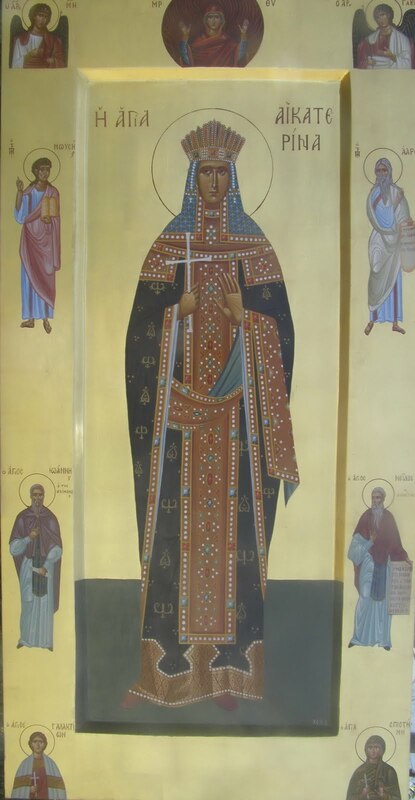 St. Theophylact of Ohrid says that Zacharias ``was outside himself and possessed by God'' when he led the Virgin into the holiest place in the Temple, beyond the second curtain-otherwise, his action could not be explained. Mary's parents then offered sacrifice to God according to the Law, received the priest's blessing and returned home. The Most-holy Virgin remained in the Temple and dwelt there for nine full years. While her parents were alive, they visited her often, especially Righteous Anna. When God called her parents from this world, the Most-holy Virgin was left an orphan and did not wish to leave the Temple until death or to enter into marriage. As that would have been against the Law and custom of Israel, she was given to St. Joseph, her kinsman in Nazareth, after reaching the age of twelve. Under the acceptable role of one betrothed, she could live in virginity and thus fulfill her desire and formally satisfy the Law, for it was then unknown in Israel for maidens to vow virginity to the end of their lives. The Most-holy Virgin Mary was the first of such life-vowed virgins, of the thousands and thousands of virgin men and women who would follow her in the Church of Christ." "And the priest received her [the Theotokos], and kissed her, and blessed her, saying, "The Lord has magnified your name in all generations. In you, on the last days, the Lord will manifest his redemption to the children of Israel". And he sat her on the third step of the altar, and the Lord God sent grace upon her; and she danced with her feet, and all the house of Israel loved her." 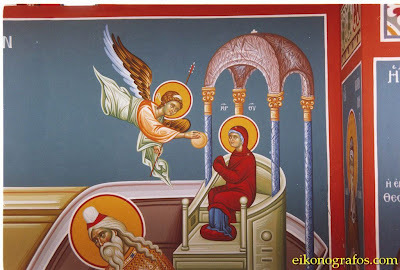 For a homily by St. Gregory Palamas on the Entrance of the Theotokos to the Temple, see: http://full-of-grace-and-truth.blogspot.com/2009/11/st-gregory-palamas-on-entrance-of.html. 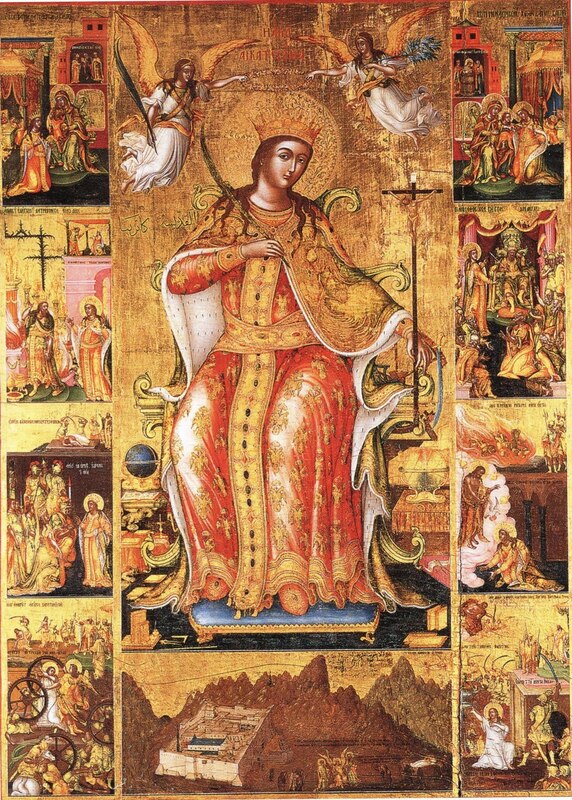 The Saviorʹs most pure and immaculate temple, the very precious bridal chamber and Virgin, who is the sacred treasure of the glory of God, on this day is introduced into the House of the Lord, and with herself she brings the grace in the divine Spirit. She is extolled by the Angels of God. A heavenly tabernacle is she. Seeing the grace of God’s ineffable and divine mysteries evident and manifestly fulfilled in the Virgin, I rejoice; and I am at a loss to understand the ineffable and strange manner in which the immaculate Maid alone proved to be chosen above all creation visible and invisible. Therefore, wishing to extol her, I am greatly perplexed in mind and speech. Nevertheless I dare to do it, and I proclaim and magnify: A heavenly tabernacle is she. Most-Holy Theotokos, save us! Amen! 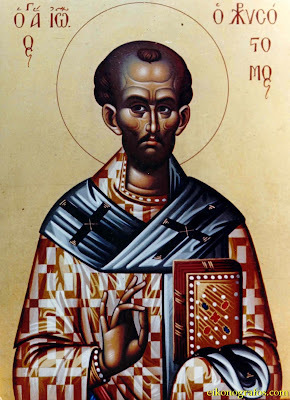 "Saint John [Chrysostom] was renowned for his explanations of the Holy Scriptures. He also interpreted the Epistles of Saint Paul, whom he admired greatly. In order to assure himself that the interpretation of the Epistles were correct, he asked God to offer him a sign. At that same time, a nobleman had risen against Emperor Arcadius. The Emperor, in turn, confiscated all of the man's possessions and threatened to execute him. The nobleman became desperate and decided to ask for Saint John's assistance. When he arrived at the Patriarchate, Saint John could not offer him an audience immediately, but instructed him to return that evening. Saint John told the assistant priest, Proclos (who later succeeded Saint John as Patriarch), to show the nobleman to the Saint's room when he arrived. That evening, the nobleman returned and Proclos went to inform the Patriarch of his arrival. The door to the room was shut, so Proclos looked through the keyhole. He saw Saint John sitting at his desk writing, with a bald-headed man, slightly bent, looking over his shoulder. Seeing this, Proclos returned to the nobleman and told him that the Patriarch was in conference. Proclos returned to the Patriarch's room several times during the night, but the man was still talking with John. Thus the nobleman waited the entire night to see Saint John. Morning came and the Patriarch prepared to perform the orthros, realizing neither that the nobleman had waited all night for him, nor that Proclos had seen the vision. That morning the nobleman returned to the Patriarchate since it was of the utmost importance for him to see the Patriach. Proclos went again to inform John of the nobleman's arrival, but again saw the same man in the Patriarch;s room. John looked extremely interested in what the man was telling him. Proclos was bewildered on how the man was entering, since everyone had to come by him. The nobleman returned for the fourth time and Proclos assured him that the Patriarch was alone, for he had made certain that no one passed without his knowledge. When Proclos went to the Patriarch's room, he was shocked to find the same man still there. He returned to the nobleman and told him to go to his home for it was impossible for him to see John. That third day, the Saint had remembered the nobleman and inquired about him. Proclos told John that the man had come three times, but each time, the Patriarch was busy talking to the same man. John asked Proclos whom he had seen in the room. Proclos told him that it looked as if it were the Apostle Paul, whose icon sat on the Saint's desk. Joyously, Saint John realized that this was the sign he had asked for from God concerning his interpretations of the Apostle's epistles. Thus, Saint John wrote The Fourteen Epistles of the Apostle Paul containing the explanation of the letters. This book is one of the greatest works in the writings of the Orthodox Church. 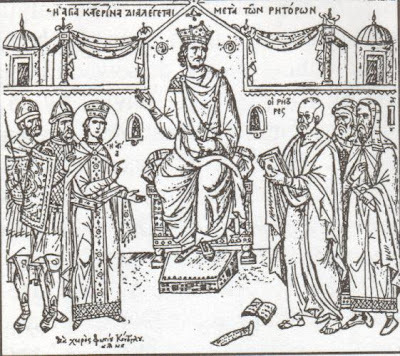 After conferring with the nobleman, the Patriarch agreed to act as mediator between the nobleman and the Emperor. Within a short time, the differences were settled and the nobleman was again granted his confiscated property"
A real photograph of the Holy Skull of St. John Chrysostom, treasured by the Holy Monastery of Vatopedi on Mount Athos. It is clear that St. John's ear is incorrupt after 1600 years by the Grace of the Holy Spirit, as a testament to the miracle related above. "As I keep hearing the Epistles of the blessed Paul read, and that twice every week, and often three or four times, whenever we are celebrating the memorials of the holy martyrs, gladly do I enjoy the spiritual trumpet, and get roused and warmed with desire at recognizing the voice so dear to me, and seem to fancy him all but present to my sight, and behold him conversing with me. But I grieve and am pained, that all people do not know this man, as much as they ought to know him; but some are so far ignorant of him, as not even to know for certainty the number of his Epistles. And this comes not of incapacity, but of their not having the wish to be continually conversing with this blessed man. For it is not through any natural readiness and sharpness of wit that even I am acquainted with as much as I do know, if I do know anything, but owing to a continual cleaving to the man, and an earnest affection towards him. For, what belongs to men beloved, they who love them know above all others; because they are interested in them. And this also this blessed Apostle shows in what he said to the Philippians; “Even as it is meet for me to think this of you all, because I have you in my heart, both in my bonds, and in the defence and confirmation of the Gospel.” (Phil. i. 7.) And so ye also, if ye be willing to apply to the reading of him with a ready mind, will need no other aid. For the word of Christ is true which saith, “Seek, and ye shall find; knock, and it shall be opened unto you.” (Matt. vii. 7.) But since the greater part of those who here gather themselves to us, have taken upon themselves the bringing up of children, and the care of a wife, and the charge of a family, and for this cause cannot afford to all events aroused to receive those things which have been brought together by others, and bestow as much attention upon the hearing of what is said as ye give to the gathering together of goods. For although it is unseemly to demand only so much of you, yet still one must be content if ye give as much. For from this it is that our countless evils have arisen—from ignorance of the Scriptures; from this it is that the plague of heresies has broken out; from this that there are negligent lives; from this labors without advantage. For as men deprived of this daylight would not walk aright, so they that look not to the gleaming of the Holy Scriptures must needs be frequently and constantly sinning, in that they are walking in the worst darkness. And that this fall not out, let us hold our eyes open to the bright shining of the Apostle’s words; for this man’s tongue shone forth above the sun, and he abounded more than all the rest in the word of doctrine; for since he labored more abundantly than they, he also drew upon himself a large measure of the Spirit’s grace. 336(1 Cor. xv. 10.)" 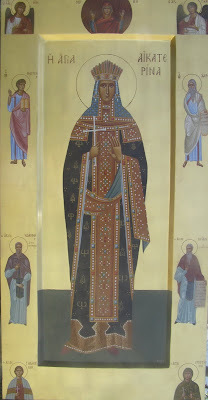 For the life of St. John Chrysostom, see http://goarch.org/chapel/saints/290, among many other sources. Apolytikion. Tone 8. Model Melody. The grace which shone from your mouth like a torch of flame enlightened the whole earth; it laid up for the world the treasures of freedom from avarice; it showed us the height of humility. But as you train us by your words, Father John Chrysostom, intercede with Christ God, the Word, that our souls may be saved. You received divine grace from heaven, and through your lips you teach us all to worship one God in Trinity, venerable John Chrysostom, wholly blessed. Fittingly we praise you, for you are a teacher who makes clear things divine. I bow the knee to the Maker of all things, I stretch out my hands to the eternal Word seeking the gift of words that I may sing the praise of the Saint whom he magnified. For he who lives to the ages said to the Prophet: I glorify those who glorify me with faith. He then, who among those of old exalted Samuel, has now glorified his Hierarch. For having traded well he brought the talent with which he had been entrusted to the King. Therefore the One above all being also exalted him. For this reason I the unworthy ask that words be given me that I may have strength to sing his praise. For he is the instructor of the of the world who makes clear things divine.